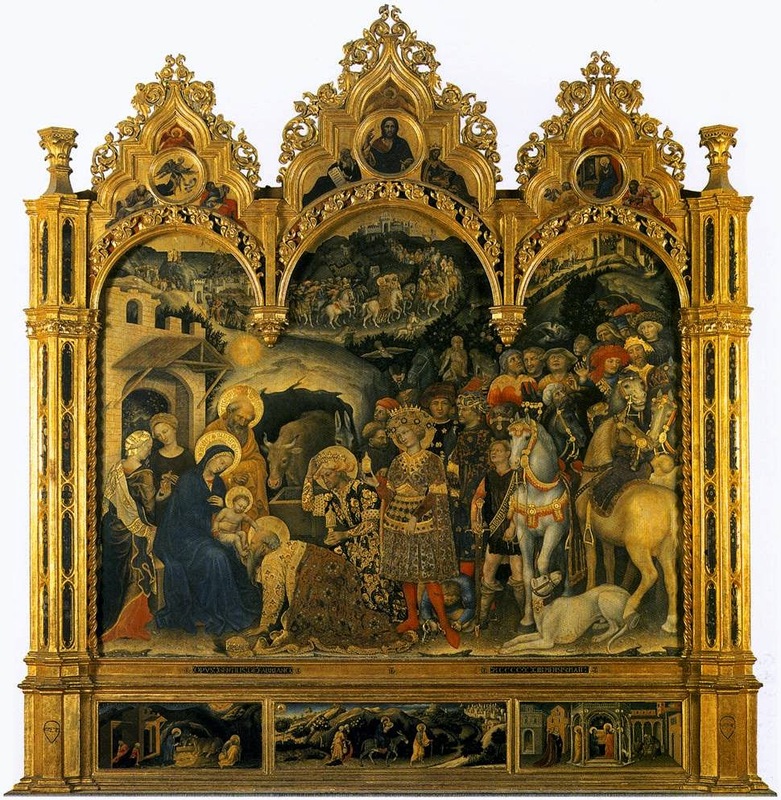 The Adoration of the Magi, by Gentile da Fabriano, 1423; originally displayed in the Church of the Holy Trinity in Florence, now in the Uffizi Gallery. Jesus was born in a humble stable and placed in a manger, true. But the Wise Men did not bring Him straw, dirt, and dung; they brought Him costly royal gifts of gold, frankincense and myrrh. The way in which Our Lord was born revealed His humility, which disdains earthly pomp; the way in which the three kings adored him revealed their humility, which looked for the best they could offer, knowing in their wisdom that it was far beneath what He deserved. It is not for us to behave as if we were Jesus come into the world, and thus to create churches that look like barns or stables or caves to receive us. ... Though Our Lord first appeared on earth in a humble manger, hidden and poor, the sacred liturgy is not time-travel to Bethlehem circa 4 B.C. The Mass ... makes present in our midst the glorified Savior whose second coming will not be in quiet poverty, but in earth-shattering splendor. For this reason, the instinct of our faith has always been to maximize the beauty of the liturgy and its diverse furnishings and surroundings, yearning for what is to come rather than indulging in backwards glances. Dr. Peter Kwasniewski, Resurgent in the Midst of Crisis, chapter 1.